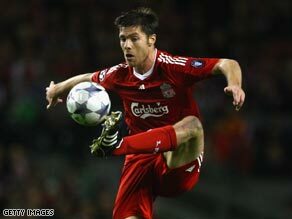 Liverpool's Xabi Alonso is said to be Real Madrid's main target. The transfer window may be fast drawing to a close but Spanish giants Real Madrid are still on the hunt for some big January purchases. Real, along with Manchester United are believed to be interested in Wigan's Antonio Valencia, but the English Premier League club has put a £18 million price on the midfielder, reports The Sun. After losing Emile Heskey, it seems they don't want to lose any more of their class players. The Daily Mirror says Real Madrid are focusing most of their attention of Liverpool's Xabi Alonso, while there is also believed to be an interest in bringing Arsenal manager Arsene Wenger, the Gunners' captain Cesc Fabregas and AC Milan star Kaka to the Bernabeu. Back to the English Premier League, where The Sun reports that the Shay Given move to Manchester City will be completed today for an estimated £8.5m. After making a big impact for Blackburn in Premier League action on Wednesday night, there's more talk today that Roque Santa Cruz will be the subject of a £20m Tottenham bid before the window closes. One thing that has gone quiet is suggestions that Liverpool and Chelsea are about to be sold - though nothing has been ruled out. If you want to read about how Middle Eastern investment is changing English football go to Football Fanzone. Elsewhere, the Daily Mail reports that Chelsea are to sign AC Milan goalkeeper Marco Storari after Carlo Cuducini left for Tottenham, and the Daily Express says that in-form West Ham are interested in Inter Milan striker Mario Balotelli. All I can say is that Real Madrid needs to strengthen their defense and Xabi Alonso is the perfect defensive midfielder who will be useful with the long balls used for counter attacks and a very good defender as well.